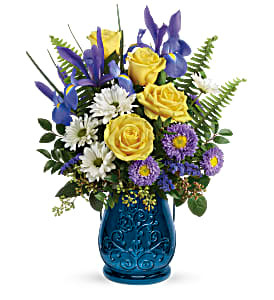 Blooming Bounty Bouquet To brighten anyone's day! 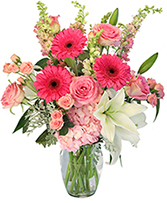 This beautiful bouquet of mixed pink, purple, green and white flowers in a whitewash basket is perfect for anytime. Arrangement shown as one-sided. 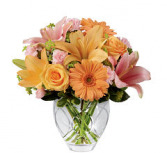 Blooming with soft colour and cheer Arrangement shown as one-sided.